A simple silhouette can make a strong graphic statement, plus they are a lot of fun to photograph! 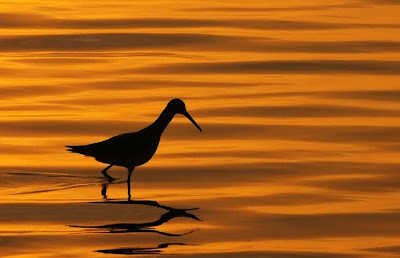 This wading bird had an elegant shape, and I was drawn toward the gentle waves reflecting the last light of day. I like sunsets and beaches, but it's the small details that get my attention such as this little bird. Photo Tip - Set your white balance to cloudy, or for a dramatic red-orange look, set your white balance to 10000 K.